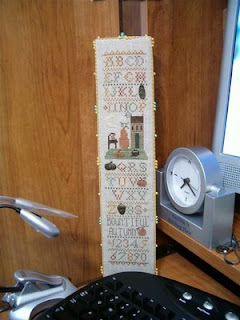 Cross Stitch Happy: Exchange from Becky SC! I cannot believe the wonderful exchange package I received from Becky SC! 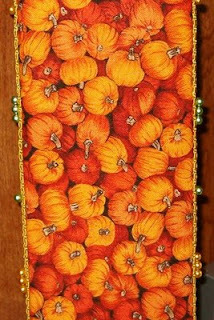 An absolutely gorgeous pinkeep that I just love! It was the perfect choice - a fall theme complete with pumpkins and cats designed by Homespun Elegance and exquisitely stitched and finished by Becky! I love the tall narrow shape which enables it to fit perfectly in its new home - tucked in the corner of my keyboard shelf of my computer armoire which is always open (I know - that kind of defeats the purpose of having a cabinet to keep the computer in!) It is much too beautiful to be put away at the end of the season so it will remain in its little corner year round so I can continue admiring it - which I will!! Becky, I hope stitching this beautiful piece brought you as much joy as the end result has brought me - thanks so much for the time and effort you spent on me! 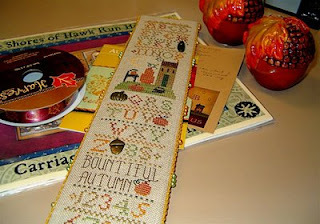 And in keeping with her well-known reputation for generosity in addition to her expert stitching and finishing, she also included (drum roll, please) "The Shores of Hawk Run Hollow" by Carriage House Samplings (WOW!) 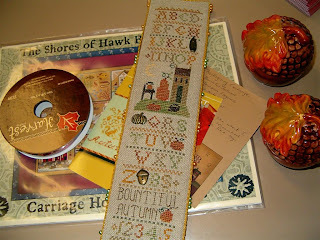 and JBW Designs "Autumn Harvest" (love this one, too), a spool of fall ribbon and a beautiful set of acorn & leaf salt & pepper shakers (which are currently on display in the living room)!!! I have been spoiled beyond belief - Thanks so much, Becky! Absolutely gorgeous! What a great exchange:) Becky is so talented! Your photos are larger (so detail can be seen) that the ones on Becky SC's blog--and wow, it is SO nice! I'm amazed by how quickly you ladies work and what a professional products you all turn out!! I've been stitching (on and off) the same freebie "heart biscornu" pattern for weeks! I've seen it many times online, and thought it was so cute (and easy looking), so I decided to try it out. Of course, I am adding some things, such as bats in the corner, and spiders too! You wouldn't believe how much time I spent agonizing over those silly spiders and bats! Thinking up elements is hard, which is why I am so impressed with your free patterns. You have so many, and post them so often! I also like your idea of a smalls exchange as a "Budget Option". I love giving gifts and sending/getting thins in the mail ever so much, but have been reluctant to try joining an exchange because of the (often large) beautiful work and opulent gifts! I would hate for someone to give me something large and with lots of fancy extras and then be disappointed by an amateurish offering from me with un-interesting "swag" bonuses. So, I would like to vote for your smalls exchange, with a suggestion that it be a small piece with one bonus "gift" of the sender's choice--not necessarily a photo/postcard. What a wonderful idea! P.S. Thanks for answering me about supplies and scissors! I think I may have seen some online I'm willing to try out! Your blog is very beautifull. This is absolutely adorable!! 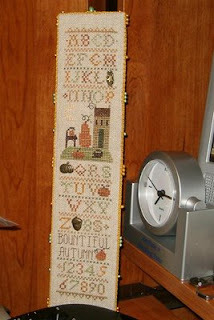 Becky is truly a great stitcher!!!! !